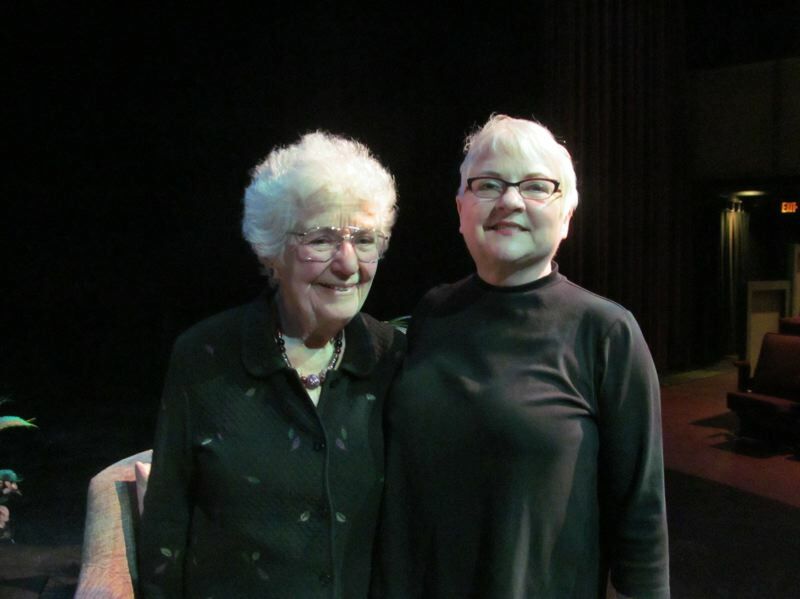 One of the darkest episodes in human history came to life Monday, March 25, when Laureen Nussbaum visited Clackamas Community College to recount her experiences in Nazi-controlled Amsterdam during World War II. 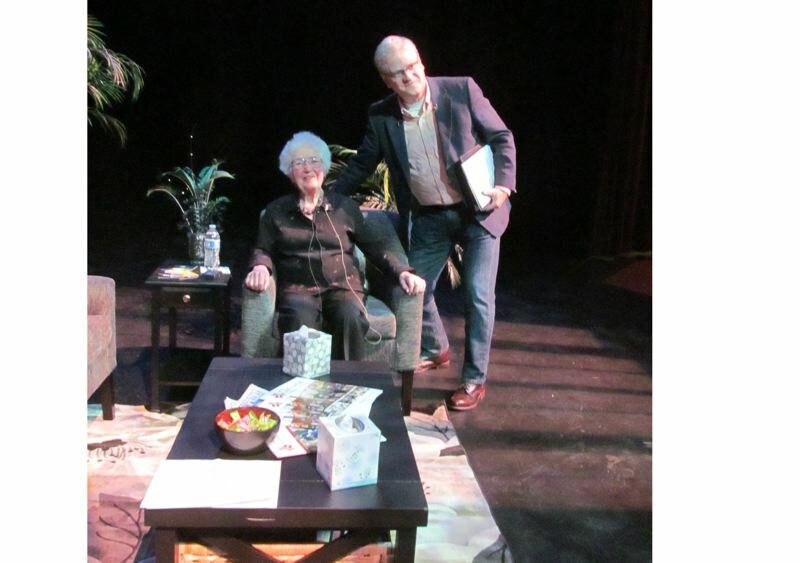 "There are very few Holocaust survivors living now, and to hear the stories straight from her mouth was extraordinary," said Julie Akers, who will direct "And Then They Came for Me: Remembering the World of Anne Frank," opening on May 23 at CCC. "She was this wonderful mixture of personal exuberance and dark warning. It's hard to know how she has had the stamina to watch the world's ups and downs without her own collapse," Akers said. "She truly is a survivor in every sense of the word." When Akers learned she would be taking the reins of the Clackamas Community College Theater Department while James Eikrem, artistic director, was on sabbatical, she began to think about what to direct for the spring play. Akers said she found herself passionately describing her experience directing "And Then They Came for Me" with young actors at Rex Putnam High School last spring. Eikrem's "eyes grew large and that was it: a split second and the decision was made by both of us. He saw the potential for his students and the Oregon City community, and I actually jumped at the chance to direct it again," Akers said. "And Then They Came For Me" by James Still "is a unique theatrical experience — a multimedia play that combines videotaped interviews with Holocaust survivors Ed Silverberg and Eva Schloss with live actors recreating scenes from their lives during World War II," Akers said. After the discussion, Eikrem remembered that Nussbaum, his German teacher at Portland State University, had a connection to Anne Frank and her family. Nussbaum, now retired, lives in Seattle but was visiting Portland during the week of spring break. Eikrem contacted her, and she agreed to come to CCC to speak to a small audience of cast members of the play and other interested people. Eikrem and Akers chaired the event and interviewed Nussbaum for the first 20 minutes of the presentation, and then opened it up to questions from the audience. Nussbaum noted that her family and Anne Frank's knew each other in Frankfurt, Germany, before the war started. Both families escaped to Amsterdam, where the Frank family went into hiding, eventually to be betrayed and taken away to concentration camps, where all died except for Otto Frank, Anne's father. Nussbaum's own family survived the war by means of "subterfuge," Nussbaum said. She explained that Hans Calmeyer, a German lawyer living in The Hague, saved thousands of Jewish families by accepting falsified papers and declaring many people only "half-Jewish." "We wore the yellow star from 1942 to 1943, then took it off when our mother was declared non-Jewish," Nussbaum said. "My family stayed together when everyone around us was being sent to camps or went into hiding," she said. But Nussbaum's boyfriend, Rudy, was not so lucky and went into hiding for four years. He was the only member of his family who survived the war, and when the two young people married in 1947, Otto Frank was the best man at their wedding. Nussbaum also noted that she and her family did not know the fate of the Frank family until after the war ended. When Eikrem asked Nussbaum how she felt about those who deny the Holocaust ever happened, she replied that "the falsification of history is awful." Akers told her that Oregon is considering a law that all high school students must study the Holocaust, and Nussbaum said that "we must pin our hopes on the younger generation." She went on to say that she is disheartened by current examples of genocide in the world even today. "We think the Holocaust will never be duplicated, but that is an illusion. I'm afraid that genocide will continue." Eikrem asked Nussbaum about a book launch that she will attend in Berlin soon. "Anne wrote many pages of an epistolary novel, which she hoped to publish, at the same time as she wrote her diary. Both ended in 1944, when she was taken away," Nussbaum said. After the war, Otto Frank was given Anne's diary and he mixed together the two texts, but now a version of the novel is being published "the way Anne would have wanted it," she said. Nussbaum added that she wrote a forward for the new book and carefully reviewed the German text since it was translated from the Dutch that Anne originally wrote in. Audience members asked Nussbaum how her experience affected her Jewish faith and what it was like to know that friends were going into hiding or being taken to concentration camps. "My Jewish identity is part of my background, and I do observe Jewish holidays. I cherish it as a memory of my father," Nussbaum said. Originally, she noted, people were told that the Jews were being "relocated to work camps," but when women and babies were taken away, it became evident that something awful was happening. Nussbaum also noted that out of 16 students in her class at school, only four survived the war, while her older sister was the sole survivor among her classmates. Rudy's father was gassed at Auschwitz and his mother contracted typhus, dying soon after the camp at Bergen-Belsen was liberated. Nussbaum noted that she and her husband have visited all the former concentration camps, because they felt they owed it to their friends and family. The day they visited Bergen-Belsen, it was "eerie," she said, because it was serene and covered with a light layer of snow. "It was quite unreal to think of what happened there." Asked how she and her husband came to America, Nussbaum said she and her husband, who had a doctorate in physics, settled in the United States in 1957. "That was the year of Sputnik, and Rudy was welcomed with open arms because he was a physicist," she said. He taught for two years in California and then the two came to Portland, where both taught at PSU. "There was not terribly much empathy; no one wanted to know how we survived," Nussbaum said. She added that people just wanted to know how much they liked the United States. Nussbaum also said that she has dealt with the trauma she experienced during the Holocaust by talking about it and answering questions. "I can't bring people back; that it still happens I cannot get over," she said. Nussbaum told the audience she has written a book about Calmeyer, the German lawyer who saved her family and many more. "So few people have the courage to stand up for the oppressed, and few people in this country know about him," she said. "We never knew what motivated him. He was not a Nazi Party member, but felt he could do more by paying lip service to those around him." Finally, Nussbaum was asked what the average person can do to keep something like the Holocaust from ever happening again. She answered, "Be open minded and speak up. Be aware of what your adversaries think." Julie Akers, who will direct "And Then They Came for Me: Remembering the World of Anne Frank," said the taped interviews of Holocaust survivors in the play feature Ed Silverberg and Eva Schloss recreating scenes from their lives during World War II. "Ed was Anne Frank's first boyfriend, and she wrote about him in the beginning of her now-famous diary. Eva Schloss was the same age as Anne and lived in the same apartment building in Amsterdam," Akers said. The Schloss family went into hiding the same day as the Frank family, and like the Frank family, they were betrayed. 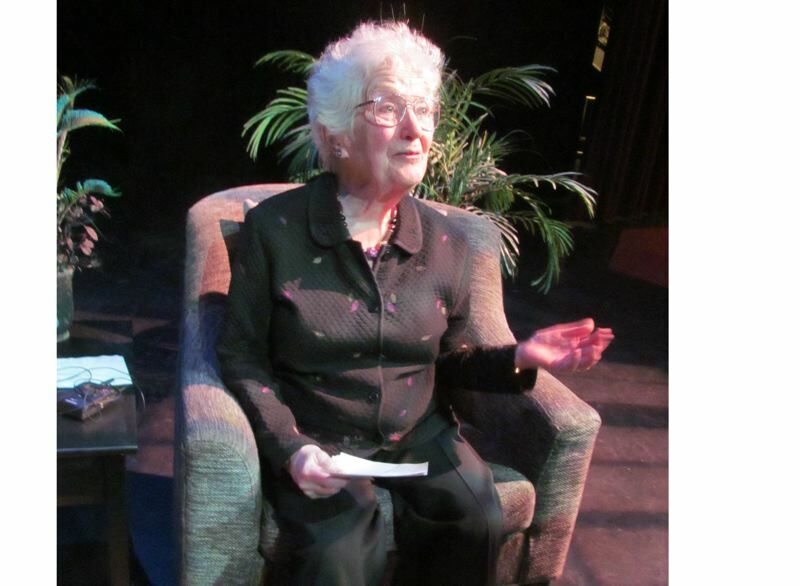 "On Eva's 15th birthday, her family was arrested by the Nazis and sent to concentration camps. Eva and her mother survived, and after the war her mother married Otto Frank," Akers said. Sydney Erlandson, a 17-year-old CCC student, plays Schloss in the production. Calling the role an amazing opportunity, Erlandson said hearing Laureen Nussbaum speak last week motivates her "to find out more about how to portray Eva." She said she wants to take all that research and "present it to the audience; it is Eva's story to be told." Akers said many of her cast members were in the audience for Nussbaum's discussion. She added, "What having her on campus did was to validate the experiences of the characters in the play. It would be so easy for (the students) to think 'this is history, so long ago,' but her presence made it real and current."